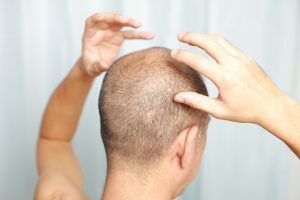 This Hair Restoration Procedure is recommended for patients with thinning hair, as well as in preparation for transplants. It involves injecting into the scalp, your own platelet-rich plasma (PRP). We speculate that PRP attracts stem-cells to regenerate hair follicles and improve the overall health of the scalp. The growth-factors released by the platelets also have a restorative effect on the scalp and increase blood flow. This further improves the color, thickness, and overall quality of the hair. This breakthrough approach has been showing dramatically positive results for our hair loss patients! The PRP Hair Restoration treatment has been gaining traction due to the scientific backing, visible and lasting results, and the price point!